The Hard drives are not as described above they are in fact. why does the system display that non of the drives can be found? Different versions of BIOS unhelpfully word things differently but what the Dell BIOS is telling you is that there are two HDDs detected but neither has a functional OS on it and so are not listed in the Boot order, one, the C: drive (which we now know is a Seagate) is where Windows previously booted from and as I previously mentioned has had RAID enabled (it would not be possible for anyone to even hazard a guess as to how this happened**) two, the WDC Blue which I also previously mentioned, again this is detected but not shown in the Boot order as it does not have an OS on it to boot from. ** How or why does the system display RAID 0 and what precisely does this mean, and how can this affect the operation of the unit in the future? 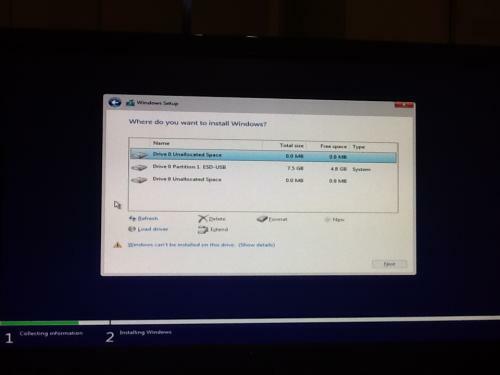 ** RAID is normally set up when installing Windows for the first time or when clean installing, never bothered with it myself but do recall with XP years back that you had to install third party RAID drivers as part of the XP installation as Windows had no such generic inbuilt RAID drivers. I would suggest physically disconnecting the WDC HDD SATA and power connections, insert your USB device that has Windows on it, restart the computer to access the BIOS, change the boot sequence so that it is USB Device first and Onboard SATA HDD second, save the new settings and exit, see if it boots from the USB device, if not, repeat the procedure but change the boot sequence to Add in HDD first and Onboard SATA HDD second, save the new settings and exit, see if it boots from the USB device, post back with an update when ready. Edited by Jb852, 16 January 2018 - 02:30 PM. Apologies for the delay getting back to you. What s the situation with the computer atm, have you installed Windows, if not but you intend to, be sure to install it on its own partition and make it at least 150GB minimum. The PC is still at the stage in the photo, quite simply due to my rule," if you don't know what your doing get advice", so do I follow the instructions which will presumably appear on the screen? Or are there step by step instructions? I would like to reinstall W10 further I have no idea or experience in partioning a drive. And just as a guide when do we reconnect the WD drive? You can go ahead and install Windows 10 (follow the on screen prompts) and the drivers for your MB, once that is done we will then partition the drive, it will only take you a couple of minutes for the partitioning. 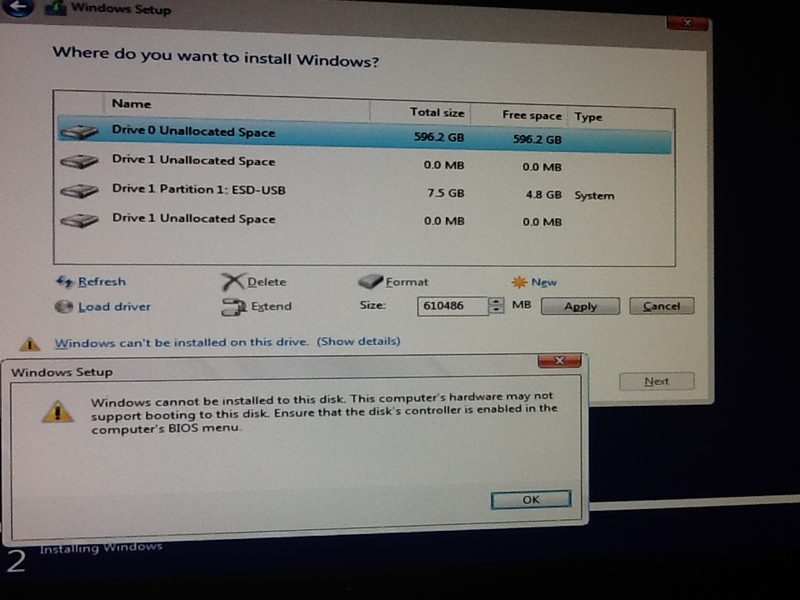 In case not already aware, Dell drivers need to be installed in a set order or you will get issues, see info here I tend to install the chipset drivers and then test, if everything is working ok I don`t bother with any other MB drivers but move on to any add on video card drivers etc. This is what I have now, reluctant to go further as I have no idea what I'm doing. Edited by Jb852, 18 January 2018 - 12:54 PM. Looks like your going to have to disconnect the Seagate, connect the WD and install Windows on that, once done connect the Seagate and see if it can be accessed at all. As directed WD is connected Seagate disconnected, back through the installation screens to this: iv selected each of the options and get the same message each time "windows cant be installed on this drive". Edited by Jb852, 18 January 2018 - 03:18 PM. Click on the 0 drive and then click on the new option at the bottom right of the screen, does it give you the option to format the WD HDD. NB: You should click on the yellow triangle (Show Details) for further info. Hi, done as requested on both counts, sorry to keep sending these but I'm way out of my depth now. As a by the by why is it showing 596.2GB when its only a 320gb drive? 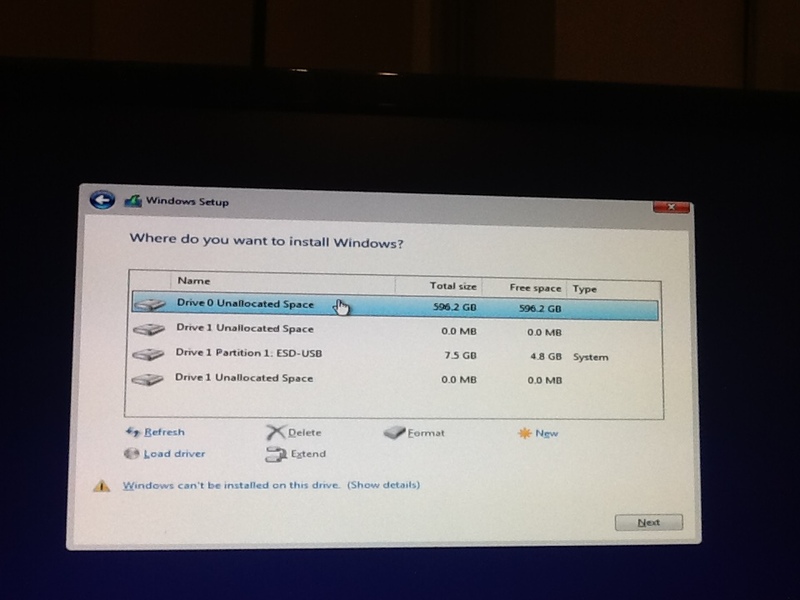 Would reformatting the drives make any difference? Edited by Jb852, 18 January 2018 - 04:13 PM. Would it not let you format the entire drive. This could be a flaky SATA cable or port on the MB or even a bad MB setting. What I would do is pull the CMOS battery and leave it out for a while (see attachment) replace the CMOS battery, set the BIOS to boot from the USB again, restart and see what happens, if still no joy, try swapping SATA ports on the MB to see if that helps. Not too good today, I will get this done tomorrow if that's ok, and will of course let you know what happens. 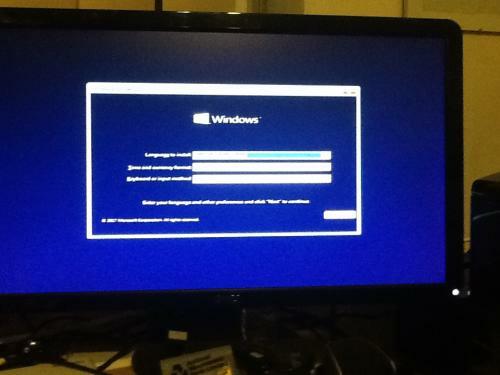 Rebooted and got back to the same screens, did a straight swop in the SATA ports of the drive with both reconnected, then a reboot, forgot that I had not replaced the Windows USB pen drive, and put the pen drive in while the PC was boot in, stupid, I know , but too late, the screen went blue and the word recovery flashed up, after a few moments the attached screen was displayed. 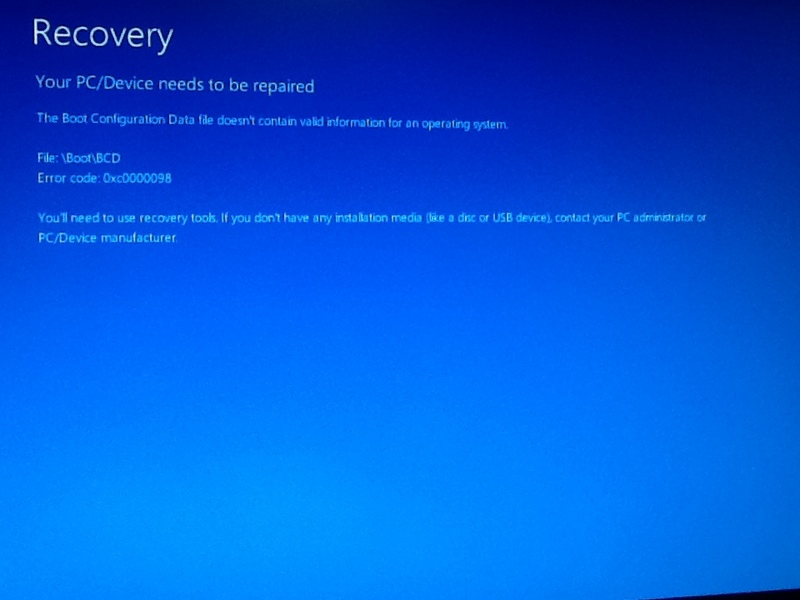 That screenshots suggests that the computer may be trying to boot from the Seagate HDD as Windows 10 was not on the WD, is the Seagate connected to the MB. This suggests that there was still a charge in the caps on the MB, should you ever need to remove the CMOS battery again be sure to press the chassis power button for 20 seconds or so once the power cord has been removed from the power outlet.